Many have probably already seen, heard or read something about languages like Esperanto, Quenya and Sindarin. Maybe some have seen films or read pieces of literature full of exemplars of the artificial languages. Yet, when people hear anything related to this, they frequently react out of total surprise, and ask questions like: That language was invented by an individual, how so? Is it a mixture of other languages? Is it a code? In Glossopoesis – The Complex and Unknown World of the Artificial Languages, the author researches the available literature and the various communities throughout the world and the Internet. As a result, the answers to the forementioned questions have been found, and a new scientific perspective on the Glossopoesis has been developed. When asked if he plans an English translation of Glossopoese, Noletto replied “I definitely plan on translating my book into English, although I don’t see it happening any time soon, since I’m already involved in a number of other conlanging related researches to make our secret vice more well-known and scientifically respected in my own language right now.” An extremely admirable goal! 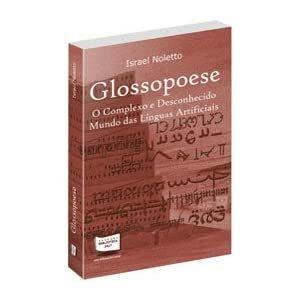 Glossopoese definitely has the potential to spread the word to the Portuguese-speaking world about the art and science of language creation. In the meantime, Noletto’s important new work should spur those English-speakers with an interest in conlanging to brush up on their Portuguese.